I’m excited to partner with One Degree Organics for this delicious recipe! 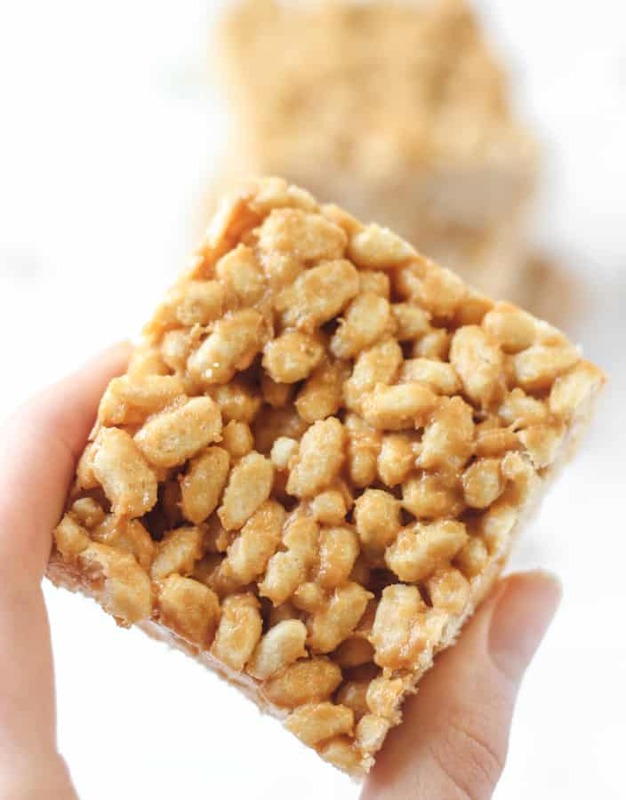 These peanut butter crispy treats are have all natural ingredients, no refined sugar, and some serious peanut butter flavor. Life lately, in a word, has been full. I prefer the term “full” over “busy” because full can be so many good things whereas I think busy has a negative connotation, at least in my mind. It’s the end of the semester, right before finals, time of the year where every class has a paper or big assignment due. My statistics class is trying to steal my joy, but I’m fighting to keep it. ???? I’m studying for the LSAT, which I’ve registered to take at the beginning of June. I’ve launched my photography business and have been doing two or three shoots per week, which I’m loving. I try to keep up with the blog and post at least once per week, although I’d love to do more. I’m trying to sleep more, eat well and cook for myself, and take advantage of the beautiful spring weather with lots of runs while also keeping up with strength training at the gym. My RA job picks up in the spring with closing the dorms and checking residents out. And of course, I want to spend time with all of the people I love at UNC before we part ways for the summer. So, so many good things, all of which I’ve chosen for myself (well, maybe not the stats class), which is why I can only say that it’s been full. In the past week, there have been times where I’ve been overwhelmed by thankfulness for the relationships that I have and the chance to do so many things that I love every day. Besides studying, working, and going to class, I get to spend my days with kindred spirit friends, eating delicious food, running, photographing people, and blogging! There have also been times of feeling exhausted and just done with the semester, but those typically pass quickly. 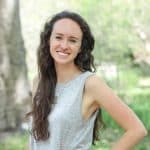 For the especially full weeks of college, I thank past-Olivia for working ahead to store meals in the mini-freezer because cooking just doesn’t happen quite as much as usaul. 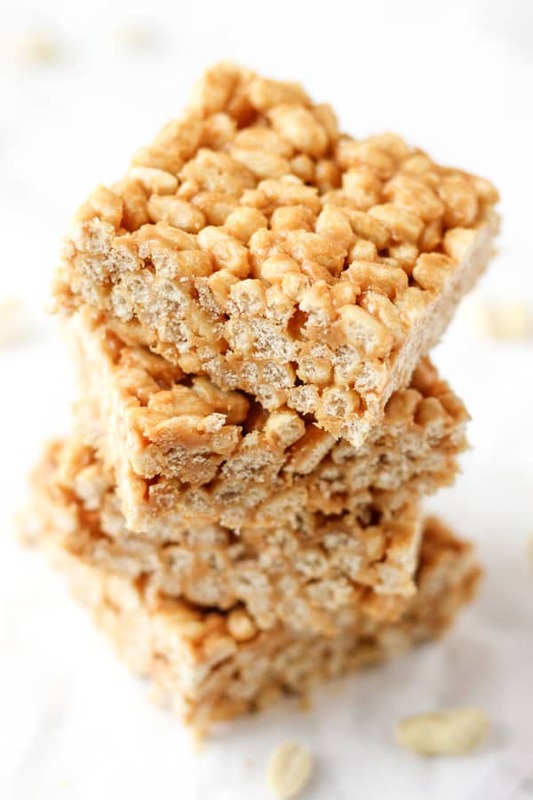 But somehow, I actually ended up making two new, incredibly easy recipes this week, one of which is these incredible peanut butter crispy treats. They took all of five minutes + one bowl to whip up and then I just popped them in the fridge. I’ve never been the world’s biggest Rice Krispy treat fan. I like the homemade kind better than the packaged ones, but they’re still not my favorite. They’re sort of tooth-achingly sweet, plus they’re SO STICKY. 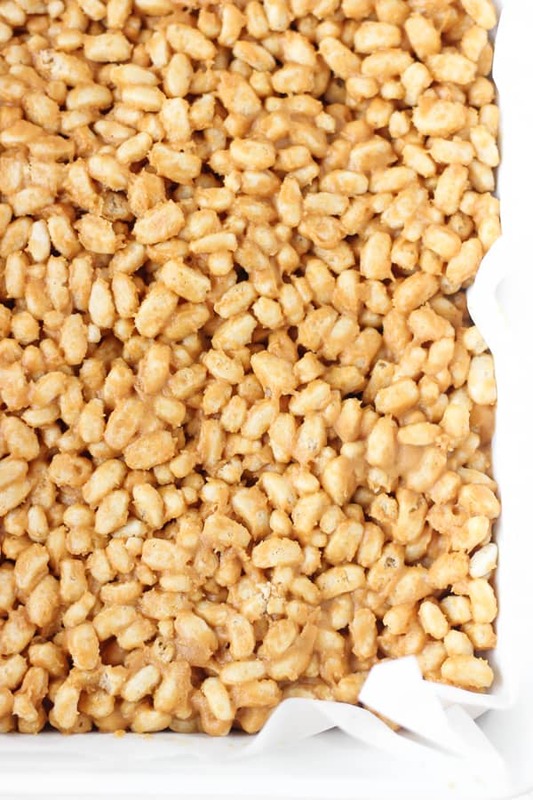 But when I got the idea to make peanut butter crispy treats…I had a feeling these would be a different story. While they’re not exactly kale salad, these have all natural ingredients, no refined sugar, and just the right amount of sweetness, with some serious peanut butter flavor. I share all recipes that I post on the blog with friends when I’m at school, and my family if I happen to be at home just to have more taste-testers and to confirm if a recipe’s a hit or a dud. These were a hit! 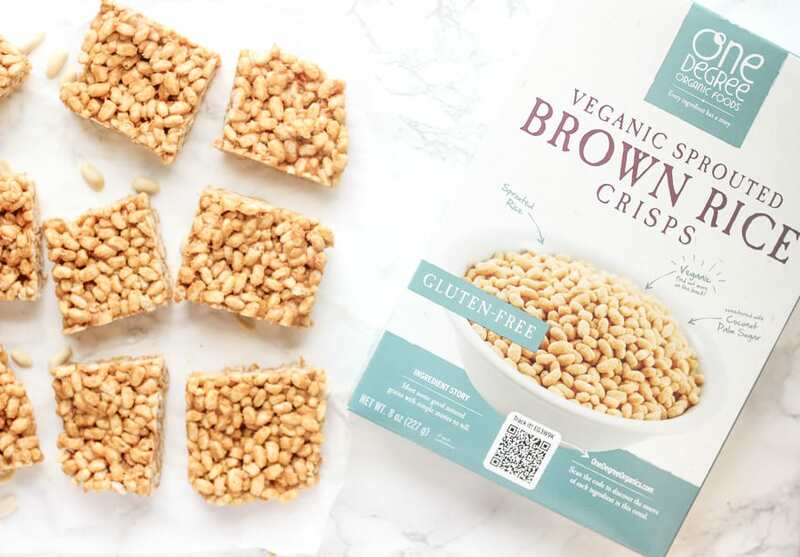 For this recipe, I used One Degree Organic’s Veganic Sprouted Brown Rice Crisps, which is basically a healthy (and delicious!) crisp rice cereal. The ingredient list includes just brown rice, coconut sugar, salt, and vitamin E for freshness. One Degree Organics is such a cool family-owned brand that emphasizes knowing your food’s origin. On the back of its products, you can see exactly what farm each ingredient came from! There are even little stories about the individual farmers, which makes me so happy as the self-proclaimed world’s biggest lover of stories. I love supporting family-owned brands and I’m a huge fan of One Degree Organics, both for the company’s mission and for their products’ taste! 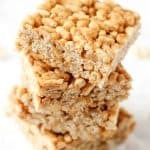 For these bars, all you have to do is melt peanut butter and honey together, stir in the the crisp rice cereal, and then press this delicious mixture into an 8×8 or 9×9 pan. Pop the pan into the fridge for a few hours, and then slice ’em up! 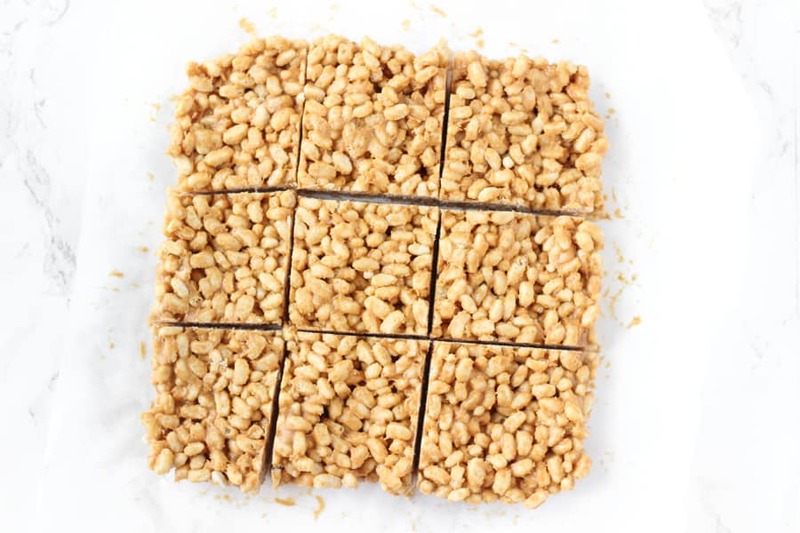 I initially cut these into nine bars since crispy rice cereal is so light, but the serious amount of peanut butter actually makes these a dense little treat, so I’ll try twelve bars next time. If you get a peanut butter craving and you’re having one of those especially full weeks, promise me you’ll give these a try! 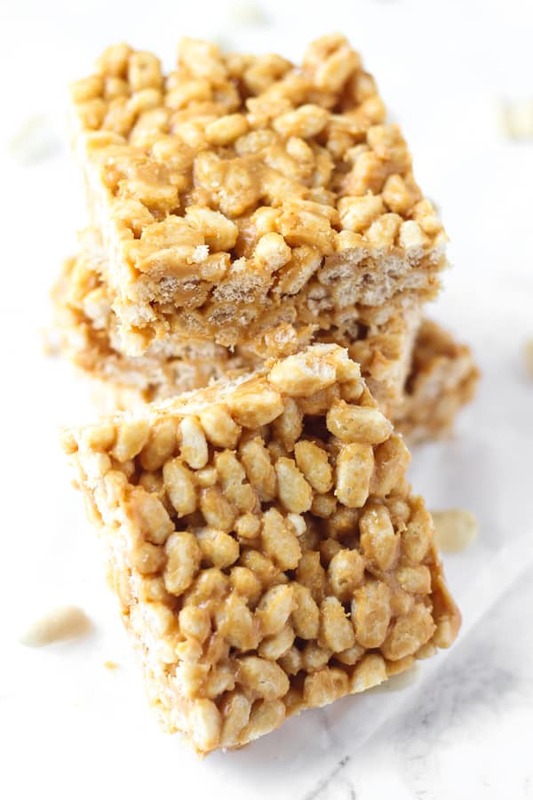 If you try out these peanut butter crispy treats, feel free to let me know in a comment or take a picture and tag me @livbane on Instagram. Hope you enjoy! Heat peanut butter and honey in small saucepan until warm or in microwave on low power for about 30 seconds. Add salt and then gently stir in crisp rice cereal. Line 8x8 or 9x9 pan with parchment paper. Pour in cereal mixture and firmly press into pan. Refrigerate for 3-4 hours and then cut into 9-12 bars. Store in the refrigerator for up to 2 weeks, or freeze for up to several months. And the peanut butter/honey is so good that you don’t miss the marshmallows! full > busy. i need to keep that in mind 😉 and of course, life is definitely fulfilling when you have handmade treats like these. best of luck studying!! Thanks, Priya! Hope that your semester’s wrapping up well, too! These are GORG girl!! I could go for a batch of these beauties right about now! You and me both! There’s just one left in my fridge and I’m already dying to make them again! These look delicious, girl! I make a similar treat that we can never get enough of! Any recipe where PB is 1/3 of the ingredients has to be good, right?! I’m with you on storebought rice krispy treats. Plus, you added peanut butter! That’s so neat that One Degree shows where ingredients come from. I really respect that in a brand! Agreed! There’s even a code on every One Degree Organic’s package that you can enter into their website to find out more about the ingredient sources for each particular product! You’ll have to let me know if you end up making it! These look awesome, by the way… so simple and without that (in my opinion, kind of icky) over-sweetness of the packaged treat! Mmm, sounds delicious! It’s hard to go wrong with the chocolate + peanut butter combo! I wish I had the ingredients for this in my house right now! Anything peanut butter just sounds too good now. thanks for sharing! I’ll be making this soon! Hope you love it, Lexi! I can’t wait to make another batch soon! Awesome recipe!One question.What type of utensils is best it preserve in freeze? As you are recommending to refrigerate for a long time. I stored mine in a gallon-size freezer ziploc bag! I am a big fan of natural peanut butter so anytime I see it added in a recipe I cant wait to try it! what else would be better along with honey to get a different flavor? I think peanut butter honestly would taste best because it has the strongest flavor, but if you couldn’t use peanut butter, you could try subbing in almond butter, cashew butter, or another nut butter! Hey Liv! I made these this weekend for a girls game night and they were a hit! So tasty and so easy. Thanks for sharing! I’m so glad you and your friends enjoyed these, Hayley! Thanks for reporting back! good recipe, I’m always looking for quick snacks and boost of carbs after working out or playing pickleball. I normally make homemade energy bars but these look like a nice treat!